Amphetamines are often prescribed to individuals suffering from ADHD and other related disorders. They can help a person pay attention longer, be more alert, and work within the same amount of time as their peers to get projects done. Amphetamines are prescribed to children, teens, and adults. However, many people abuse amphetamines for their effects, and it is important to be aware of these signs of abuse. Amphetamines are part of a class of drugs that include “amphetamine, dextroamphetamine, and methamphetamine” (CESAR). They are called central nervous system stimulants because this is the part of the body they effect. When a person uses amphetamines, “the neurotransmitters dopamine and norepinephrine are released from nerve endings in the brain and their reuptake is inhibited.” This keeps the neurotransmitters at the synapses, making the person feel awake and focused. People abuse this effect, especially with prescription amphetamines, to stay awake for long periods of time. Sometimes called study drugs, amphetamines are abused for this purpose often. Methamphetamine is an illegal drug that has a similar effect. Whether prescription drugs or illicit, people abuse them in many ways that are unhealthy, unsafe, and illegal. 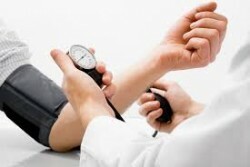 Having high blood pressure is one sign of amphetamine abuse. Amphetamine abuse can be highly dangerous to a person’s health, affecting all different areas of the body and putting the person at risk of “convulsions, coma, and death” (CESAR). It also causes withdrawal symptoms which include “tiredness, panic attacks, crankiness, extreme hunger, depression, and nightmares” (ADF). If you know someone who may be abusing amphetamines, seek treatment for them immediately. The abuse of any of these drugs, whether received by prescription or illegally purchased, can be very detrimental to the body, the mind, and the life of the person involved. Look for these signs, especially in children who take amphetamines as prescribed and do not understand the risks, and seek treatment if needed.